The Monterey Bay Aquarium is widely recognized as one of the world’s most impressive aquariums. It hosts 1.8 million visitors annually, and is a must-see attraction for anyone visiting Northern California. BrightSign has been the aquarium’s digital media player of choice for several years, and in 2012, the aquarium began an extensive effort to update some of its most iconic exhibits, including the Sea Otter Exhibit and the Open Sea. Digital signage was used extensively throughout these exhibits and at other points in the aquarium to bring visitors closer than ever before to the action within its expansive network of tanks and other enclosures. In addition to the time and money that was saved by these new installations, the aquarium achieved what it ultimately set out to do – to dramatically improve the viewing experience for its visitors. Using state-of-the-art digital signage, the aquarium was able to reduce congestion at its most popular exhibits, while simultaneously bringing visitors closer to all of the amazing creatures of the sea that call the aquarium home. By providing live, visual access to parts of the aquarium that were previously off limits, the aquarium used the very latest in technology to support its mission of bringing its visitors closer to the sea. Many of the players are situated near water. In addition, the aquarium’s humid climate is further complicated by the corrosive elements of wind and mist that blow in from the bay. All of the aquarium’s signage must operate for at least 16 hours a day, seven days a week. Legacy signage was unreliable and required its own ventilated, climate-controlled enclosure. Nonprofit resources are in tight supply, and therefore keeping costs low was an important consideration. Screens needed to perform multiple functions, to showcase live events as they happened, and blend with the natural aesthetics of the exhibits. Nearly 150 BrightSign players used throughout the aquarium. HD cameras feed live content to BrightSign players, giving visitors a behind-the-scenes view into parts of the exhibits that were previously inaccessible. Narrators toggle between video feeds using a customized iPod Touch app. HD cameras in the Sea Otter Exhibit allow visitors to witness feeding shows from vantage points that were previously disconnected from this popular ritual. A pair of 90-inch displays was installed in the viewing area of The Open Sea to bring viewers closer to the action that’s typically hidden from sight. Cindy’s Waterfront Restaurant is outfitted with 12 new digital menu boards; BrightSign’s software and the BrightSign Network make it simple to update menu content, promote specials and make changes in real time when certain items become unavailable. Marine Mammal Gallery features a 15-foot-tall video wall comprised of six NEC X55UN screens in portrait orientation networked with six BrightSign HD1020 players, displaying a montage of artistic images shot in 4K HD. BrightSign’s solid-state devices are extremely resistant to water-based damage and are perfectly suited to this challenging environment. BrightSign’s 99.9% uptime performance is essential for the aquarium to deliver an educational, uninterrupted experience to its patrons. BrightSign’s players run reliably 24/7 without the need for special enclosures or climate control. Even after the cost of the display screen, the complete BrightSign solution still cost less than half compared to the previous PC-based solution. 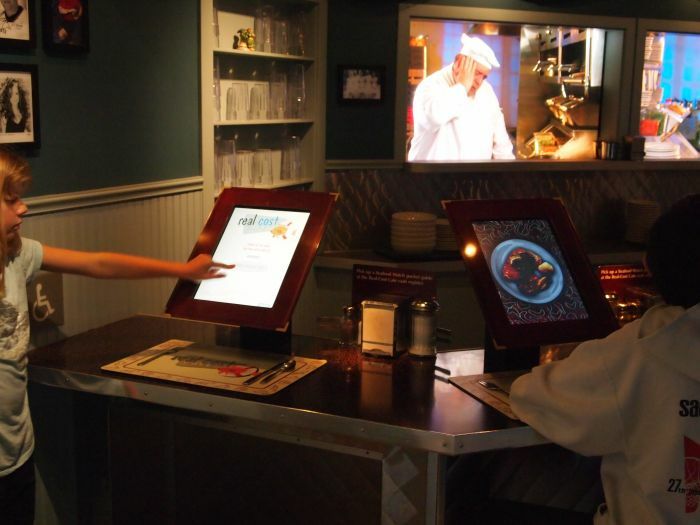 Many of the screens that display looped or interactive content also provide live video during feeding shows to give people an eyewitness perspective on the inhabitants’ dining habits.